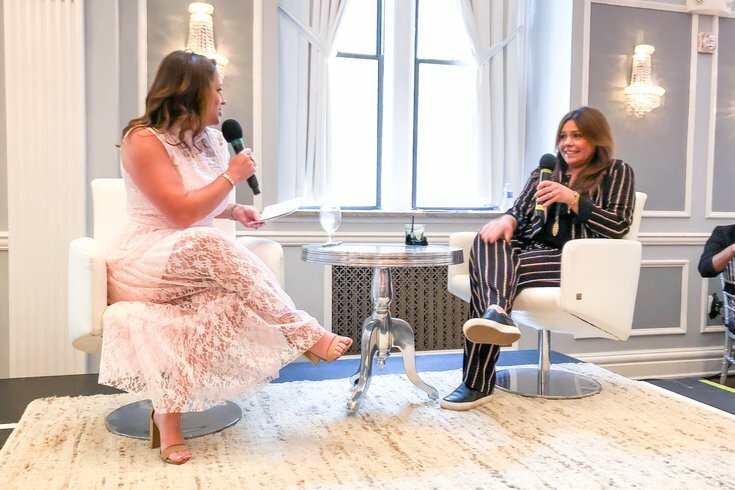 Celebrity Chef Rachel Ray, right, spoke with BEN FM host Kathy Romano during the 2nd Annual HerStory Luncheon where Ray was the keynote speaker, Saturday, April 14, 2018. He gets a ton of great press as it is, but Philly’s James Beard Award-winning favored son Michael Solomonov can add another name to his list of fans – that of celebrity chef, TV personality, author and businesswoman Rachael Ray. “Zahav is my favorite restaurant in the country – easily,” she said. Ray paid a visit to Philly over the weekend to serve as the keynote speaker for 95.7 BenFm’s HerStory luncheon, hosted by Kathy Romano and held at the Arts Ballroom Saturday in Center City. The second annual event of its kind, the HerStory luncheon highlights local women who make a significant impact in their fields. But after opening remarks, the regular schedule of speakers and award presentations, Ray had already downed a couple cocktails. Romano barely got through her prepared questions for the daytime talk show host before Ray laughed at herself and admitted to being a chatterbox. “I’ve never cooked a 30-minute meal after a glass of wine in my life,” she joked. “No one teaches you to cook in an Italian family. The living room is for strangers. Everyone is in the kitchen,” she said. Ray – who will turn 50 in August – said that from an early age, members of her family learned how to feed themselves with what was in the cupboard. She was peeling potatoes when she had pigtails and knew how to make a scrambled egg simply by watching her mother work. But one of the funniest bits Ray divulged over the course of an hour was that she has sampled her own pet food, Nutrish, made for dogs and cats and from all-natural ingredients. She said she and her husband have cooked for their dogs at home, and that she has eaten the food before. "It needs a little salt, but that's me," she laughed. Her show, “Rachael Ray,” is going into its 13th season, and when asked what’s given it staying power, Ray said she hoped it inspires people to cook something different. “Our show is kind of a mash-up,” she said. When Ray rose to fame in the early 2000s, she said she hated the sound of her voice and she never imagined herself on television. As for her preference on Philly cheesesteaks? “Geno [Vento] comes on our show all the time, so, it better be Geno’s,” she laughed.